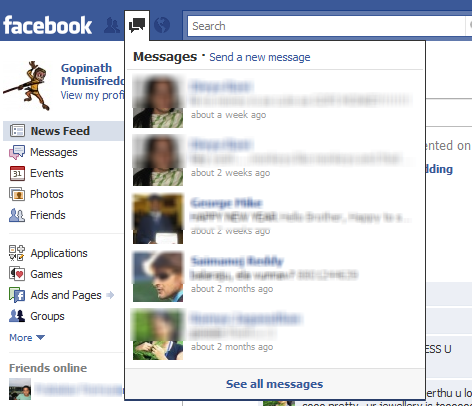 The top menu located next to the Facebook logo now groups options to easily access Requests, Messages and Notifications. Earlier these options were scattered across the page. Also we don’t need to move to a new page to access any of these options. They all open inline on home page. Messaging icons available on the top left section opens up the inbox in a nice popup and provides easy link to send new messages. Messaging was never this easy in Facebook and I think this UI layout will push me to use more Facebook and less GMail for messaging friends. Accessing chat is very easy now. You can view the list of online friends below the left side menus, similar to GMail’s chat window. I was never comfortable with the menu bar placed in the footer of web pages. The earlier design of Facebook had a menu at footer and in the new design the footer menu bar is completely removed. The footer options are now moved to left and top menus and they are grouped well for easy access. These are the features that I like in the new Facebook design. What about your favorites? Yes, I like new Facebook design too, especially where Notifications are now. Everything is more user friendly.